A new budget proposed by Washington Gov. Jay Inslee, a Democrat exploring a 2020 presidential bid, calls for increasing the state’s operating budget by 20 percent, increasing taxes, and spending more on orca and salmon recovery than on the number one issue voters said is their top priority: mental health. Additionally, the state’s fiscal conservative think tank, the Washington Policy Center (WPC), argues the state already has the funding for salmon and orca recovery and does not need to raise taxes. Instead, "the governor is simultaneously claiming he cares about salmon and orca while his budget shows he will only help them if we raise taxes," Todd Myers, the WPC’s environmental director, said. Inslee’s $54.4 billion state operating budget proposal – about 20 percent more than the current budget – increases revenue by $3.7 billion in higher taxes. They include a 9 percent tax on capital gains earnings, increases in business-tax rates for services, and "progressive" changes to the real-estate excise tax. Inslee said the package was necessary to fund the government and make Washington’s tax system "less regressive." The capital gains tax would be imposed on earnings over $25,000 for individuals and $50,000 for households. The tax excludes retirement accounts, homes, farms and forestry transactions. It reportedly impacts only 1.5 percent of Washington households and is projected to raise $975 million over the next two years. Sen. John Braun, R-Centralia, the ranking Republican on the Senate budget-writing committee, said Inslee’s proposal would hurt small businesses. "Ultimately the governor wants to go on an extreme spending spree," Braun said in a statement. "At some point, the public is going to run out of patience with annual demands for billions more of their money." The request for more money took backstage to the national attention Inslee received for his emotional plea to spend $1.1 billion on orca preservation in Puget Sound. Saving the existing 74 endangered orcas will cost taxpayers at least $425 million more than Inslee pledged to fix the state’s failed mental health system (about $675 million). "We share so much with the orcas, we share about the same body temperature, we share about the same heart beat rate, we share close familial social interactions and bonds, and we share the need to defeat environmental degradation," Inslee said in his budget address. "When we save the orcas from toxins, when we save the orcas from climate change, when we save them from pollution — we save ourselves." "We’re asking those who have done so well to chip in a bit more," he told reporters later. "This makes the system just a little bit more fair." Fairness, Inslee emphasized, includes how the state’s "southern residents," or endangered orca whales, are treated. They are at their lowest numbers recorded since the 1970s. The $1.1 billion plan includes salmon recovery efforts, state transportation and wildlife agency funding, several toxic and storm-water cleanup measures, and reduction of vessel traffic. The plan also calls for developing plans "to move or kill seals and sea lions" that primarily eat the Columbia River salmon and deplete the orcas’ primary food supply. It also includes a three-year ban on commercial whale watching and extended no-go zones and slow-go zones for vessel traffic. However, Myers, who sits on the Puget Sound Salmon Recovery Council, said the amount the governor is proposing for salmon recovery is actually less than what he asked for four years ago. The governor "is not prioritizing salmon and orca recovery," Myers argues, because his "rhetoric is not matched by the budget he proposed." For example, the governor’s proposal includes spending about $400 million more on opening up streams to salmon by fixing culverts. "But he is tying this to an increase in the real estate tax," Myers said, when the federal government already ordered the state to fix the culverts. "Yet instead of using less than 10 percent of the new funding the state has, he is trying to use it as an excuse to raise taxes. 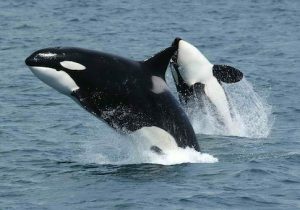 So, despite the governor’s rhetoric, his budget does not prioritize salmon or orca," Myers added. Higher taxes contribute to less affordable housing and homelessness, he said, concerns voters expressed are issues the Legislature should prioritize. According to the most recent Crosscut/Elway Poll, which surveyed 502 registered voters, the largest number, 27 percent, said fixing the state’s social services, addressing homelessness and mental illness, should be the state’s top priority. Among specific goals for the Legislature, 86 percent listed mental health first; 70 percent listed creating affordable housing first. Nearly one quarter of Washington’s 7.2 million residents have a mental health disorder, the Washington Institute for Public Policy reports. Washington’s percentage is more than nearly any other state – and yet it consistently ranks last or near last for its level of treatment, the institute points out. The state Supreme Court and federal inspectors have criticized the state’s largest mental health facility for not having enough beds, admitting untreated patients to jails, and for having a high number of inmate assaults against staff members. Inslee’s proposed $675 million would fund creating hundreds of community mental health beds and launch a new teaching hospital through the University of Washington that would focus on mental health.